Liberal Folly » Is Hillary Receiving an Anti-Woman Bias? Front Porch Punditry » The Woodshed » Liberal Folly » Is Hillary Receiving an Anti-Woman Bias? A Hillary supporter slipped into pookie's collection today. I'm pretty good at recognizing a Hillary Clinton, "Card-Carrying" 'Water Boy' or 'Water Girl' when I see one, and this toon reveals Adam Zyglis is definitely one. This whiner tries to put into humor a DNC diversionary tactic by complaining about the blow back she's been getting post her 9/11 collapse. The idea is, no attention should be given to the substance of these claims. The 'real issue' is something other than the negative attention she's been getting from her lack of transparency. The fact is she's hiding something BIG! And THAT is newsworthy!!! History will write about this version of her 9/11 event, even if today's idiots want to cover up its tracks in order to get her elected. 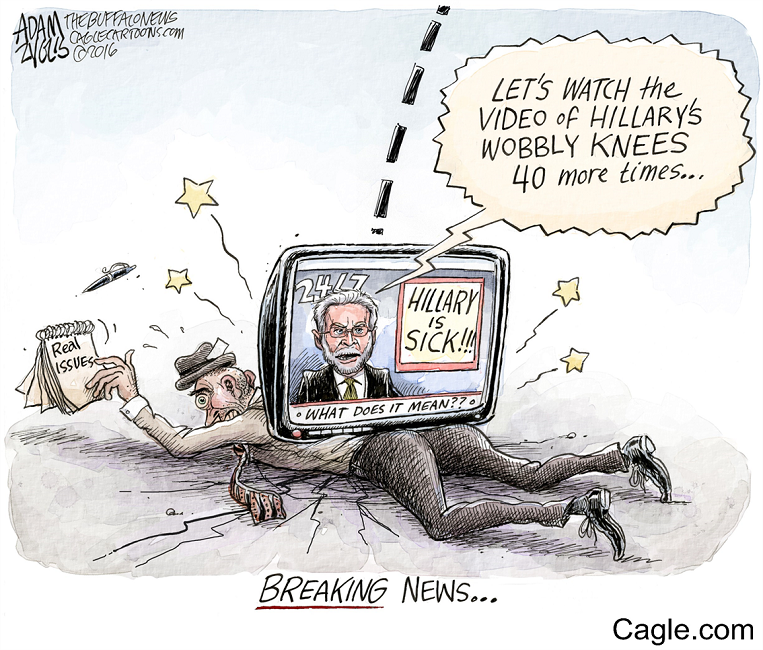 Hillary and her supporter's deceptive ways want to dismiss her failing health as not a real issue. Lying to us about her health problem isn't a 'real' issue. I heard one CNN reporter minimize the 9/11 event by saying "Hillary tripped". Wow!!! That conclusion must've required a whole lot of DNC Kool-Aid! 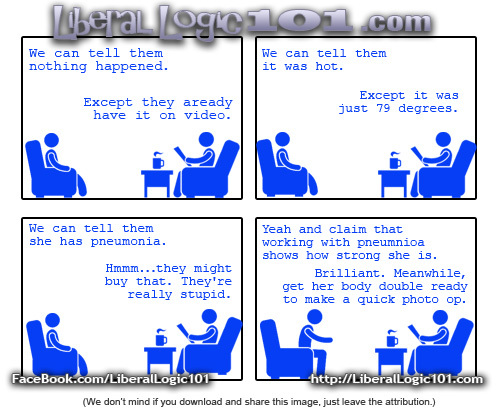 Bill Clinton said that "she had a cold". She's VERY lucky that most reporters are referencing her collapse as merely 'a fainting' because it wasn't a fainting, as revealed in Dr. Noel's analytical video below. And then Hillary's first prize for 'Water Girl' has to go to Christiane Amanpour, who on her 'New York Sunday' show, tried to blow up the story completely. Amanpour told us that the negative coverage Hillary is receiving is nothing less than a fresh assault on women in power. Her negative attention was just another part of the war, [extreme bias] against women in power! Amanpour thinks we should be casting all reason aside and acknowledge that Hillary's negative press is a patriarchal and sexist assault on her, an extreme bias against women. No thanks Christiane! "Can't a girl have a 'sick day' or two?" she asks? Here's her remark in its context: "Like so many things Hillary, the media are having a field day, off to the races with another debilitating case of indignant outrage. This must be another typical Clinton conspiracy to fool them with total transparency breakdown. Talk about a transparency breakdown—what about Donald Trump’s tax returns? Where are they? Can’t a girl have a sick day or two? Don’t get me started because when it comes to overqualified women having to try 100 times harder than underqualified men to get a break or even a level playing field, well we know that story." What??? This default accusation is such a handy tool in the Democrat strategy toolbox. Xenophobic, sexist, racist, Islamophobic, Gender bias, blah, blah, blah. When have you EVER heard a Republican use one of these accusatory divisive labels??? This is a pure DNC strategy play!!! This Amanpour tactic has run its course this year! It's got no more steam! Trump isn't any of those labels and he just won't fall for it. He's no Mitt Romney! Go Donald!!! The fact is on 9/11, Hillary suffered a serious neurological event. It was serious! It wasn't caused by the NY heat, it wasn't a reaction to dehydration, it wasn't a cold or the flu, it wasn't allergies or even pneumonia. She did not collapse as by a fainting, limp like a rag doll. She experienced a taut neurological freeze which rendered her immobile! It was all, unfortunately for her, caught on video and we have it from two different angles. An article on this subject by SE Cupp. Long before Hillary Clinton announced her bid for president, the leftist media began the tiresome task of defending the sexist attacks she had not yet faced, but was almost certain to. When Hillary entered the race and her Democratic opponent Bernie Sanders was beating her among women, many decided that wasn’t because he was a more talented candidate, was more authentic and trustworthy or simply had better ideas, but rather because of sexist double standards regarding her outsized ambition. Now, whether you agree that women face sexist obstacles while running for office or that toughness is tricky for women, Clinton’s inarguably ambitious nature has not been the Achilles’ heel that liberals predicted. In fact, it’s been the exact opposite: Is she tough enough? Before you cry sexism, this isn’t because of some kind of 1950s throwback to vapors and fainting couches. And it’s not because of a vast right-wing conspiracy. She didn’t face this question in 2008. She’s facing it now, however, for obvious and uncontroversial reasons: She’s eight years older and has had a string of health issues, including the latest episode when she appeared to faint at a memorial, and was thrown into a van “like a sack of meat,” according to one law enforcement official. This nonsense proves yet again that feminism is so invested in Hillary Clinton, despite her complicated role as Bill Clinton’s wife, that we must believe obvious weaknesses are actually strengths, and that it’s sexist to both notice her ambition and question her health. Her gender makes her uniquely qualified and uniquely victimized. Enough. Here’s the bottom line: Hillary Clinton’s health, like Trump’s finances — and his health — should be public record. It’s the least voters deserve, and gender’s got nothing to do with it.